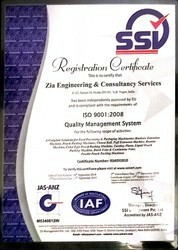 Zia Engineering & Consultancy Services, began its operations in the year 2008, as a manufacturer, supplier, exporters and traders of one of the finest range of Food Processing Machine. This highly acclaimed and asked for range of products is made up of Corn Puff Extruder Machine, U Type Mixer Blender Machine, Horizontal Flow Wrap Machine and many more. These products with commendable performance and longer service life, is manufactured following the norms and guidelines of the industry and utilizing the finest raw materials and modern machines. Further, we offer our clients with the most affordable repairing services. Our highly advanced infrastructural facility, which has been equipped with all the necessary machinery and amenities, facilitates the attainment of a number of the firm’s set goals and objectives. The facility, for reasons of smoother and effective management, has been divided into a number of units. These units under the supervision of skilled and experienced professionals, facilitates greater revenue and productivity. For the purpose of boosting our position in the market, we keep upgrading our facility on regular intervals. Further, our work practices, have helped us in maximizing our production capacity, and generate a huge client base. Under the able leadership of Mr. Masoom Akhtar and Kausar Ali, we have managed to attain greater heights of success. Their ability to foresee market changes, and manage in the best possible manner, have smoothened our path to success. In addition, he takes special care of the employees, by providing them regular increments and rewards. We export our products all over world. We are considered in the market to be one of the leading manufacturers, exporters and traders of this impeccable range of Food Processing Machine. For reasons of maintaining this reputation, we engage in the utilization of high grade raw materials and advanced technology, in compliance with the set industry norms and guidelines. Owing to this, the range is known to have an impeccable performance, precision, user friendly nature and a longer service life. In addition to this, the range is known for its impeccable packaging, timely delivery and reasonable pricing. To us, quality is of high importance. Thus we engage in the utilization of high grade raw materials and modern machines, as per the set industry norms and guidelines. Owing to this, the offered range is known to have an impeccable performance and longer service life. Further, to provide our clients with highly standardized products, we process the products through a number of quality examinations, where any and every manufacturing defect is eliminated, with high level of precision and perfection. Our highly advanced state of the art infrastructural facility, laced with all the necessary machinery and equipment, has helped us reach the place where we are today. The facility facilitates the attainment of a number of the firm’s predefined goals and objectives in the most efficient and effective manner. For reasons of managing the operations of the firm, in a manner which is quite smooth, we have parted the facility into units. These units, with high level of dedication and precision, have maximized the firm’s production capacity.